2 Fordyce, Alexander Dingwall, Family Record of the Name of Dingwall Fordyce, in Aberdeenshire: Showing Descent from the First Known . . ., Toronto: C. Blackett Robinson (1885), Appendix lxxxix, Google Books (Digital Library). 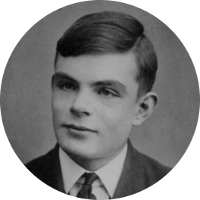 3 Furness, Hannah, "Benedict Cumberbatch and Alan Turing are related, genealogists claim", The Telegraph, (accessed 06/30/2017).